How to make a disk image and restore from it later? I'm a new Linux user. I've reinstalled my Wubi from scratch at least ten times the last few weeks because while getting the system up and running (drivers, resolution, etc.) I've broken something (X, grub, unknowns) and I can't get it back to work. Especially for a newbie like me, it's easier (and much faster) to just reinstall the whole shebang than try to troubleshoot several layers of failed "fixing" attempts. Coming from Windows, I expect that there is some "disk image" utility that I can run to make a snapshot of my Linux install (and of the boot partition!!) before I meddle with stuff. Then, after I've foobar'ed my machine, I would somehow restore my machine back to that working snapshot. What's the Linux equivalent of Windows disk imagers like Acronis True Image or Norton Ghost? Note: I found a similar question: Easy backup/restore of installed system? The tutorial for Clonezilla can be found here. dd is the low level utility that you can use to accomplish this task, it essentially a low level byte-for-byte copy utility. If you want the "UNIX" way of accomplishing this, then read on. All references to the file system and hard disks are located locally on the virtual /dev/ filesystem. There are a multitude of "nodes" in /dev/ that are interfaces to almost all the devices on your computer. For example, /dev/hda or /dev/sda would refer to the first hard drive in your system (hda vs sda depends on the hard drive), and /dev/hda1 would refer to the first partition on your hardrive. You can use the exact same command to backup the entire hard disk (replace hda1 with hda). You can then use any compression program (gunzip, zip, bzip) to compress the file for storage. You can use this same technique to make rote copies of entire partitions to make clones of your computer. There is one limitation though, when restoring the backup, the partition needs to be the same size (or bigger) as the partition you took the image from, so this limits your options in case of a restore. However, you can always expand the partition after you've restored the backup using gparted or parted. The picture gets even muddier when you are trying to restore entire disk copies, however, if you are restoring the backup to the same exact hardrive you don't need to worry about this at all. However, if you want a "friendlier" utility ala norton ghost then this suggestion might not be for you. 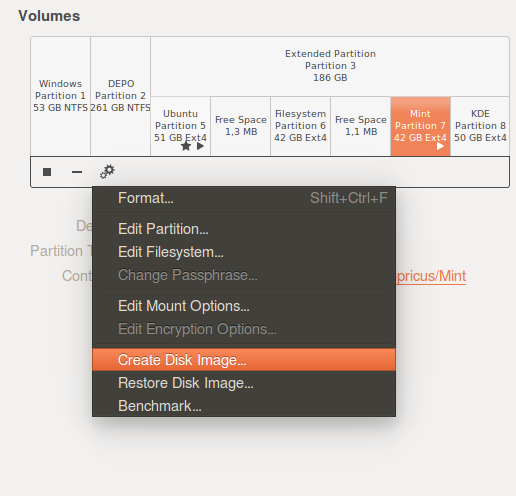 We have a GUI available in Ubuntu, called 'Disks' (gnome-disks) and comes default in later Ubuntu. Launch/search as "Disks", or run as gnome-disks. A live Ubuntu (or derivatives) live-session usb-stick. Also, one has to take notice that the back-up and the restoration of bootable partitions are both risky procedures and that a back-up of valuable/sensitive data should be first done in a different way (by copying the data instead of the entire partition, etc). - From my experience, this works with Ubuntu system partitions but not with Windows ones. Optionally, in order to minimize the space taken by the saved image, a partition can be first shrunk (from end, that is from right) so that it would not include the empty space. Here is a post on that: create partition backup image no larger than its files. See the comments under the above linked answer on the fact that Gparted reports the difference of space between the destination partition and the restored one as un-allocated space. That can be fixed with Gparted: select partition and apply "Check" action. it needs to have enough free space: use Gparted to "Check" (claim the non-allocated space as said before) and enlarge the partition if needed and possible. use grub-repair from a live session in order to install grub. I use this procedure: https://askubuntu.com/a/182863/47206, with some more detail here: https://askubuntu.com/a/326661/47206. The "dump" and "restore" backup utilities in the Ubuntu repositories provide you with the ability to backup and recover an entire system's "system state". Boot from your Ubuntu live CD/DVD/USB. Restore (i.e. restore -r -f my_file /my_mount). Note: If you are restoring to a new disk you will need to install your bootloader (GRUB). To restore a drive image, one will want to boot into a live environment. Restoration is quite simple, and really just involves reversing the if and of values. This will tell dd to overwrite the drive with the data that is stored in the file. Ensure the image file isn't stored on the drive you're restoring to. If you do this, eventually during the operation dd will overwrite the image file, corrupting it and your drive. When restoring the whole drive, the system will not automatically create the devices (/dev/sda1, /dev/sda2, etc.). Reboot to ensure automatic detection. From this list, you can cross-reference the information with that of fdisk to know which drive is which. Then simply update the UUIDs in both GRUB and fstab files. I would recommend RemasterSys for this Task. It creates iso for your installtion, Backup user Date with Deja Dup. There also Ghost for Linux, but Clonezilla is the better option - it's more up to date. The latest version of Ghost for Linux is listed May 2009, while Clonezilla's latest version was posted in November 2010. One minor limitation of Clonezilla compared to Ghost is that you can't resize the partition on restore, while Norton Ghost can. You probably won't need it, but Clonezilla also supports multicasting. Using "Dump" and "Restore" is one solution, as indicated by virtual.stack. You can also use "Back In Time (backintime-gnome)" (available from Ubuntu Software Center) or else (Déjà Dup, ...) alongside to get a backup of your data. You just have to include ("/home", "/etc", "/var", "/usr/local", ...) in the backup profile. Like that you can get back your healthy system with Clonezilla and then your latest data with "Back In Time" or else. If you're using Wubi, why don't you just boot into Windows and copy the root.disk file? Then restoring is as easy as renaming root.disk to something else, and renaming the copy to root.disk. The link I provide in this and other instructions in step 2 does not work anymore. However, I had downloaded the Remastersys files before the website shut down and they can be installed perfectly through Ubuntu Software Center. !! I am not sure if the files are available in Ubuntu Software Center, but if you have them on your computer, they can be installed through it. You need a program that can produce an iso file, and this is Remastersys. This set of instructions helped me install and run successfully remastersys on Ubuntu 14.04.1 32bit and also successfully create and use a bootable flash drive with the custom iso I made. Note: a flash drive works unless you manually made an upgrade of the kernel for some reason before making an image of the system. IMPORTANT: I downloaded version 3.0.4-1 i386 and it WORKS I checked 3.0.2- version and it doesn't work. Now look for two lines with "www.remastersys.com/" in the list you can find on the Other tab and make sure you check both boxes. Enter a password if you are asked to. Once you finish your initial machine reboot and start your Clonezilla Live CD and make a clone from your initial harddisk to others. You can also use Ghost for Linux G4l. download iso from here then burn to Cd and use it Live CD. Can i create image of my current installed ubuntu so that i can install it on other machine? How can I do a full image backup of my system? How to backup and restore the system? What software can I use to make a mirror image of Ubuntu? how do I make a backup of my entire system so I can restore it later? Is it worth it to change from Ext4 to Ext3 in order to use Partimage?